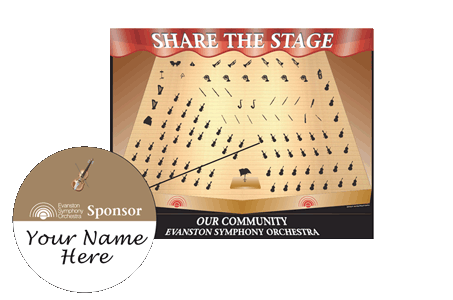 Sun., May 12, 2019, 2:30 p.m.
Share the Stage lets you sponsor a chair in the Orchestra. It’s our way of recognizing that the ESO Community is made up of Orchestra Members and Supporters. Give the gift of music by ordering directly from our website and purchasing a custom gift certificate in any denomination of your choice! Certificates may be redeemed for single ticket or season subscriptions for any of our concerts. You will receive an electronic gift certificate or we can mail the certificate to you or directly to the recipient. The Evanston Symphony Orchestra welcomes for the second year in a row the popular Evanston Symphony Holiday Gospel Choir led by Rev Ken Cherry. The choir will once again sing a gospel version of Handel's Hallelujah Chorus, which delighted audiences last year. The ESO in 2015 commissioned the orchestration of this piece, with funding from the Evanston Arts Council, so this performance and piece are uniquely and specially Evanstonian! The good cheer of the holiday season finds its most joyful expression through song, from the traditional carols we all know and love, to contemporary gospel and choral works. This year’s program will showcase it all, including Deck the Halls; What a Wonderful Child; This is Chanukah; John Rutter’s Gloria; and more. The Hallelujah from Quincy Jones’ Handel’s Messiah: A Soulful Celebration will delight the crowd once again, and it just wouldn’t be Christmas without the annual sing-along. Founded in 1997, the Evanston Dance Ensemble’s mission is to deepen the exposure to and appreciation of dance for highly talented and committed young performers and diverse audiences in the greater Chicago area. We’re excited to have them back for the 10th time to celebrate the holidays with us. They’ll be dancing the March, Dance of the Sugar Plum Fairy, Candy Canes (Russian Trepak), Tea (Chinese Dance), Dance of the Reed Flutes, Chocolate (Spanish Dance) and Waltz of the Flowers from The Nutcracker. The Evanston Symphony Orchestra will perform pieces by some of Vienna’s most celebrated composers at its season-opening concert this month. Among them is Schubert’s majestic Symphony No. 9, “The Great,” a work that lives up to its name. Music by three of the great Viennese Classical composers will launch the 2016-2017 season. Following a dramatic opening with Beethoven’s Coriolan Overture, the October concert continues with Mozart’s Violin Concerto No. 5 in A Major, “Turkish.” One of Mozart’s most popular pieces, the concerto will be performed by Alexandra Switala in her first appearance with the Evanston Symphony. We open our first concert of our Symphonic Blockbusters season with Beethoven’s Coriolan Overture. This exciting overture reflects the drama of the story behind it. In 1802, he saw Heinrich Joseph von Collin’s play, Coriolan, based on one of Shakespeare’s less frequently performed tragedies, Coriolanus. The play was popular for a short time in 1802 and then faded from the stage. However, in 1807, it had a one-night revival at the palace of Beethoven’s patron, Prince Lobkowitz, solely for the introduction of Beethoven’s overture. Although there is no doubt that the "New World" is the most popular of Antonin Dvořák's nine symphonies, most musicologists and Dvořák scholars are in agreement that his greatest symphony is the Seventh. Read more about Dvořák's Greatest Symphony? The Double Concerto for Violin and Cello in A Minor stands apart in the Brahms’ canon. It was his only double concerto, and his last work for orchestra. Thank two trends of the 19th century for the high-spirited, rollicking dances on our June program. Dance-style pieces for piano four-hands (a single piano played by two pianists) and compositions inspired by Europe’s minority culture, particularly the Roma (Gypsy) culture, were all the rage. Beethoven's Fifth: Ever Popular, Ever Thrilling! What is there new to say about Beethoven’s Fifth Symphony? It is, after all, one of the greatest, best-known and frequently played orchestra pieces ever written. It was first performed on Dec. 22, 1808, at the Theater an der Wien in Vienna, along with the premieres of Beethoven’s Sixth Symphony and Fourth Piano Concerto, with Beethoven conducting and at the piano. Oh, for a time machine! Read more about Beethoven's Fifth: Ever Popular, Ever Thrilling!